Read Book After the King: Stories in Honor of J.R.R. Tolkien Online author by Martin H. Greenberg. Read or Download After the King: Stories in Honor of J.R.R. 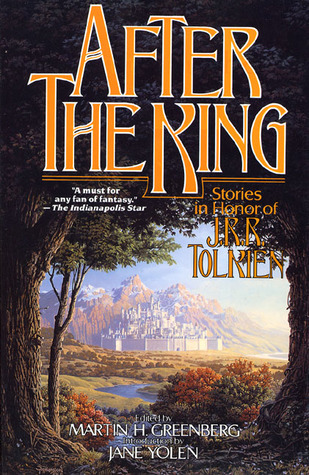 Tolkien format Paperback in 438 and Published 11-10-2001 by Tor Books. After the King: Stories in Honor of J.R.R. Tolkien After the King presents an outstanding collection of new fantasy stories by an extraordinary assemblage of some of the very best writers to ever continue the tradition Tolkien began with The Lord of the Rings. Stephen R. Donaldson, Peter S. Beagle, Andrew Nortong, Terry Pratchett, Robert Silverberg, Judith Tarr, Gregory Benford, Jane Yolen, Poul and Karen Anderson, Mike Resnick, Emma Bull, Elizabeth Ann Scarborough, John Brunner, Harrr Turtledove, Dennis L. McKiernan, Karen Haber, Barry M. Malzberg, and Charles de Lint contribute to a dazzling anthology that captures the spirit and originality of Tolkien's great work. The millions whose lives have been touched by J.R.R. Tolkien will find the same primal storytelling magic here, undiluted and running ever on.